Bailey ‘hounding’ investigation dropped. Now there’s a surprise.. So, the police have dropped the investigation into the alleged ‘hounding’ of ‘Cure the NHS’ founder Julie Bailey because of lack of evidence. Lack of evidence. The police unable to find enough evidence that any of the ‘hounding’ actually happened – despite having conducted an investigation that included interviewing ‘witnesses’ and examining CCTV footage, according to the Express and Star newspaper. The SKWAWKBOX has long observed that Ms Bailey’s claims of harassment so bad that she was ‘forced’ to quit Stafford were clearly massively overblown and probably invented – and now the police appear to have reached the same conclusion, although obviously they’re unable to come out and say so plainly. It used to just be my mum’s voice I heard in my dreams..But now there are so many voices in my head, so many stories, they’ve all become confused. If the townspeople of Stafford didn’t already have their hands full preparing a legal fight to try to overturn a pre-ordained decision to close their hospital, I’d be recommending that they bring the biggest class-action in history against the media – in particular the Daily Mail – for libel. Crucially – and completely in line with other information I’ve received over recent months – Ms Bailey did not go to the police to complain. Instead, they went to her because of her constant complaining to the media. So we have a woman making media claims that she didn’t feel inclined to report to the police – who, when they do hear about it and investigate, find no evidence of any of it that they can pursue. Mr Walker has shown his true colours often enough, and very soon his tactics degenerated into raising someone’s spent criminal conviction in order to try to taint by association (which I won’t repeat by reproducing it here). Sadly, the ability to see that someone’s history has no bearing on the validity of their logic when arguing with them seems beyond Cure and their supporters. But this Pavlovian reaction is extremely illuminating of the Cure phenomenon. Every claim and accusation is treated by the media as fact without investigation or challenge – even when the claim is clearly implausible – and this habit seems to have led Ms Bailey and her supporters to think that they have a right to be offended, and to lash out vindictively, if their assertions are challenged even in the most logical and evidence-based fashion. Fortunately, Staffordshire police appear to have treated Ms Bailey’s claims of ‘hounding’ with more objectivity – and in doing so, they have concluded that they are unfounded, or at least unsupported by evidence. Which was clear all along to anyone remotely objective who bothered to actually look into it. And the goes for – or at least cause doubts to be raised about – all of her and her pals’ claims. It would be nice to think there will now be a series of apologies, or at least corrections, relating to this ludicrous blackening of the name of a whole town. But don’t hold your breath. I do hope that this shuts her up but somehow I don’t think it will as she is just out for the limelight and enjoys media attention, personally I think in her head she thinks she is a celebrity. I applaud you Steve for your dogged persistence in righting a wrong that is the Stafford scandal. Unfortunately I think this is just the start of many more battles to come from other trusts and instead of it being the exception it will be the norm as the coalition is hell bent on destroying the NHS for their own gain. Please keep fighting for what is right Steve, our knight in shining armour..
No Steve, no surprise at all is it? I’ve seen the Twitter conversation that @Modernleader started, but avoided contributing as it included contributions by Roger Kline, who once tried to gang up on me with one other Bailey supporter to suggest that because I was so vociferous in my defence of Stafford Hospital now, I obviously didn’t care about my patients then – guilt by association, as of course to certain individuals and groups nurses at the hospital between 2005-09 were all evil uncaring monsters. But I digress. 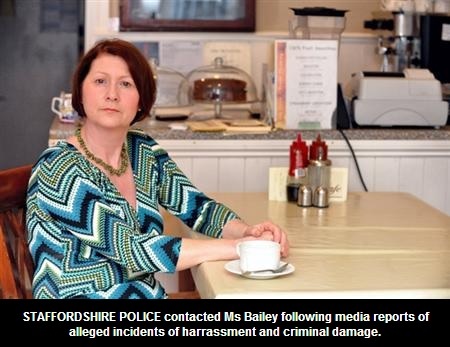 The Staffordshire Newsletter’s take on the police dropping their investigation includes the interesting titbit that they approached Ms Bailey over the accusations she was already making in the press – not, as anyone might have rightly suspected, the other way around. The fact the police have found no evidence to back up these claims speaks volumes. And it is still no coincidence that this “hate campaign” only sprang up in the wake of the Stafford March, in which 51,000 decided to support the Hospital that Ms Bailey and her supporters have spent years demonising. It was nothing more than a cynical attempt to take attention away from the March and garner some sympathy for Ms Bailey, as well as an excuse to deliberately try and blacken the names and reputations of certain individuals and groups. And subsequently a whole town, simply because they voted literally with their feet, by not supporting her and taking the limelight away. And that’s pretty damn shameful. What a great point. I’ll add that in! The ‘mobbing’ is very typical. Do you still have a record of that conversation, by any chance? 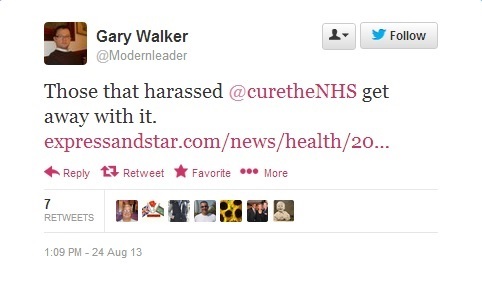 You claim I dont know you and neither do you know me…but you feel able to link to our Twitter discussion,(or “mobbing” without addressing the situation where Ms Bailey was accused of shouting out at a public meeting that ALLEGEDLY she wanted the Hospital closed and all the nurses sacked. This has been proven to be lies by people who were there and I wonder if police interviewed them either. You were rightly voiciferous of your job at Mid Staffs Hospital and by your own admission “as of course to certain individuals and groups nurses at the hospital between 2005-09 were all evil uncaring monsters” and its this that Julie Bailey & CURE (Not CLOSE) the NHS were addressing! 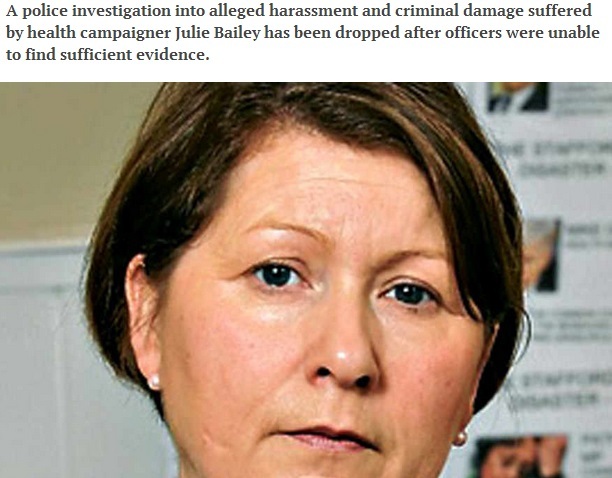 Plus Julie Bailey’s comment on hearing about the investigation being closed was that she had “forgotten” about it – someone who is the victim of a serious campaign of harassment would NEVER say that. To be fair, I’m pretty certain the ‘forgot’ comment was about a different case entirely – a baby death in hospital, IIRC. Dee, your response is rather incoherent as usual. You just add some unwanted bluster and paranoia. Can’t be hard to find evidence of a grave being desecrated though can it ? JB didn’t take photographic evidence of such having taken place suggests that it didn’t happen. I know if it had been the grave of my loved one then I most certainly have taken a photo and presented it to the police. Twitter is a public forum, comments are there for any to read or use. If you don’t want that for something you tweet, don’t tweet it. 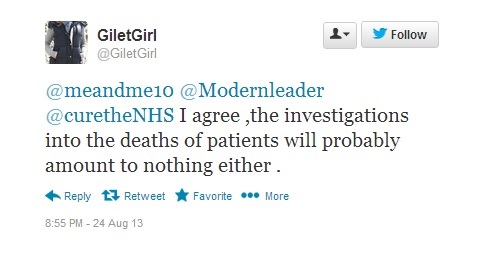 As for ‘proven’ that Ms Bailey didn’t claim she wanted the hospital closed, it’s anything but proven. A couple of her supporters have said ‘she didn’t say it’ – hardly proof of anything. There are more with no vested interest in the matter who were there and concur that she did say it – and it’s entirely consistent with her behaviour since. She has refused to acknowledge at all the huge improvement at the hospital, and has continued to act and speak as if nothing had changed – if it ever was as she described in the first place, which is extremely doubtful. And you’re claiming that evidence was removed or ignored? It would have been the simplest of matters to film the grave (which has never once been pictured in a ‘desecrated’ state), and indeed police examined CCTV – and clearly found nothing. You’re grasping. And ‘treated in this way’ is far from proven to have happened, so the rest of your point is moot – but the short answer is no. If my mother died, I’d address that issue and attempt to do so with fairness, balance and in proper context – a million miles away from the attitude and behaviour of Ms Bailey and her supporters. Firstly Ms Speers quoting me back at myself out of context is tiresome, but i’ll let that one pass me by. What I linked to was you and Roger Kline (someone who claims in his Twitter profile to be fighting discrimination, as long as you’re obviously not a nurse at Stafford Hospital) of agreeing that I was not as vociferous about my patients then as I was now, despite my protestation and without any basis in fact. It had nothing to with Ms Bailey’s alleged comments. I’m also sorry my sarcasm about nurses “being evil uncaring monsters” based on what was being reported by the media seems to have slipped by you. I must try harder. Either that, or you’re using both points above to try and needlessly fudge the issue of whether Ms Bailey said what she did. I do have respect for grieving families, and i feel genuinely sorry for those who believe their loved ones were lost unfairly. However, i do feel that many such cases, particularly within the membership of Cure the NHS, were lost in the face of Ms Bailey’s self-righteous grandstanding, and the fact that the media at large took her completely at her word for so long. With that in mind and with all due respect I do not see how you can compare the sad loss of your son and that of James Titcombe’s baby son with the claims made by Julie Bailey of a “hate campaign” to the media, that clearly were made for ulterior motives and were not reported to the police. There is no comparison to make, unless you’re trying to somehow shame me into silence. And that would be shameful. Miguel Cubells has found corruption everywhere he looks LOL. In fact everyone who disagrees with him is corrupt! Would be awfully nice if CURE now decided to remove the lies about me from their web page – but I wont hold my breath, but I might just contact the police about it, if I thought for one second that they didn’t have better things to do. Do get the police involved, there are a number of people who are complaining and it might make them take it seriously. Head full of confused voices? Paranoid delusions of being hounded? Ms Bailey might like to consider getting a psychiatric assessment. Complete waste of police time and tax payers money! they think they have clinical knowledge- they don’t! they think they have political knowledge – they don’t! they think they have political power – they don’t ! they think they make a difference – they don’t! they think they speak for patients in this country – they don’t! they think they can get the press to print their crap – they do! they think they can get a few obscure Tory politicians to back them – they do ! they think they can get lawyers to use ‘cure’ brand to make as much money for them as possible – they do! they think they can continue to financially benefit from this – they do! To be fair, I’m pretty sure that comment was about a completely separate case – a nurse accused of culpability in a (baby?) death in hospital, IIRC. John and Steve, the case that Ms Bailey forgot about was the taping of a dummy into a baby’s mouth on the paediatric ward at Stafford Hospital, allegedly by a member of staff. Although working there you of course hear all sorts of wild rumours and hearsay – patients drinking dirty water out of flower vases, that sort of thing – but in this case the strongest indication was that the dummy, after being DNA tested, was NOT taped in place by a member of staff, but someone else. Make of that what you will. Ah, that’s the one. Yes, she was so outraged about it she forgot it. That’s very interesting Shaun – so how come this was never mentioned in any of the media reports??? Typical of the skewed coverage. Possibly John, though I suspect the implications of who might actually been responsible and their possible motives could have left them open to remonstrative action from the public. I’d like to find out if a police officer ever actually stated the handwriting on the card JB received was “that of a middle aged woman”, as I can’t believe they would. That would catch Julie Bailey out in yet another flagrant lie if it wasn’t the case. So long have we, as a family, waited for the thruth to finally emerge..by definition of Ms Baileys claim that she was hearing “so many voices” in her head, implied that our mother was talking to her too..since she passed (peacefully) away on the same ward, at roughly the same time as Ms Baileys mother.. This claim, amongst many others, hurt us deeply, and yet, when in a thread in a local newspaper on line, I mentioned this, I was told our grief was nothing compared to theirs! You cannot argue with minds like that, however much pain you feel. So thank you Steve, for your bravery in telling the truth. It is frightening how Cure claim to speak for all alleged victims, yet when any of them challenged Cure they get attacked. They do not permit any argument whatsoever. The media should take note. The message from this is clear, stick to the facts and eventually the truth will out. There is a right wing American who has made a placard saying Keep Calm….. meaning though, they know that what they are doing is wrecking everything around them, so, so long as they hold their nerve it will all go away. The problem being they overlook the wreckage left behind that speaks volumes about them and what they have done. Keep going Steve we are winning, it just doesn’t look like it at the moment. A recent article pointed out that the Tories are haemorrhaging party members, the recent disclosures of using false statistics must be having an effect. On the subject of the role of the media, not heard any news from the BBC Trust yet on the level 4 complaint about misuse of Stafford “deaths” figures by the BBC. In terms of their processes it has now been quite a long time. Are they having a SERIOUS look at this? Lets hope so, as it involves many journalists and an underlying editorial policy over several years. Has anyone else drawn comparisons between Alicia Esteve Head (9/11 Faker) and Julie Bailey? I don’t know that case, but I’ll look it up. I’m sure it will make fascinating reading!